President Trump appears to be retaliating against House Speaker Nancy Pelosi for suggesting he postpone his State of the Union address amid the ongoing partial government shutdown by postponing at the last minute her planned trip to Afghanistan. "We will reschedule this seven-day excursion when the Shutdown is over. In light of the 800,000 great American workers not receiving pay, I am sure you would agree that postponing this public relations event is totally appropriate," Trump wrote in a letter to Pelosi. "I also feel that, during this period, it would be better if you were in Washington negotiating with me and joining the Strong Border Security movement to end the Shutdown." Pelosi and other members of the congressional delegation, commonly referred to as a "codel," were on a bus headed to the airport to depart, and the Capitol Police already had personnel on the ground in Europe for the trip. Other members slated to be on the trip included House intelligence committee Chairman Adam Schiff, D-Calif., House Veterans' Affairs Committee Chairman Mark Takano, D-Calif., and Rep. Stephen Lynch, D-Mass. 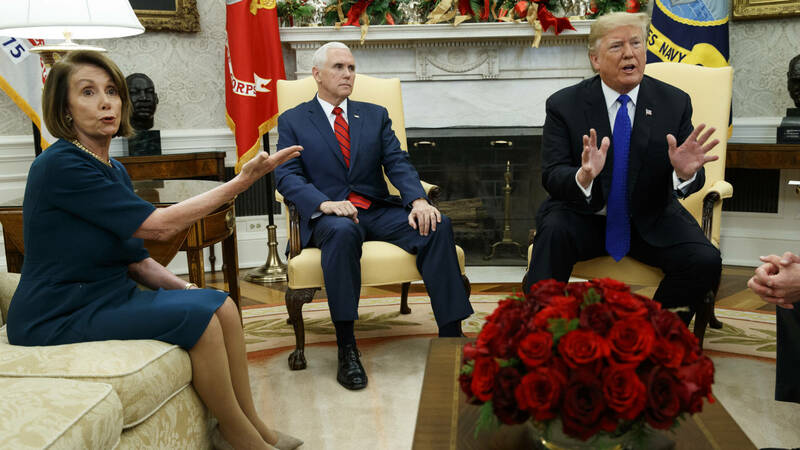 This is the latest back-and-forth between the president and the new Democratic speaker as a nearly monthlong partial shutdown shows no signs of ending. The two parties remain at a stalemate, with Trump demanding funding for a wall or barrier along the Mexican border, and Pelosi and other Democratic leaders on Capitol Hill insisting the government should be reopened before negotiations continue on border security issues. Pelosi fired the first volley against Trump earlier this week, when she wrote that his annual State of the Union address, originally slated for Jan. 29, should be postponed until after the full government reopens, citing, in part, security concerns. Such a planned trip by Pelosi to a war zone had not been publicly announced, and would not have been for security reasons. The speaker would use military planes for such travel, and that is what Trump is now denying her. "Obviously, if you would like to make your journey by flying commercial, that would certainly be your prerogative," Trump added in the letter. Pelosi spokesman Drew Hammill said in a statement that while Trump's letter claimed Pelosi and Democrats were also traveling to Brussels and Egypt, the stop in Brussels was simply for pilot rest, where "the delegation was scheduled to meet with top NATO commanders, U.S. military leaders and key allies – to affirm the United States' ironclad commitment to the NATO alliance." A stop in Egypt was not on their agenda, Hammill said. "The purpose of the trip was to express appreciation and thanks to our men and women in uniform for their service and dedication, and to obtain critical national security and intelligence briefings from those on the front lines," Hammill continued, pointing out that the president "traveled to Iraq during the Trump Shutdown as did a Republican CODEL led by" New York Rep. Lee Zeldin. Trump ally Sen. Lindsey Graham, R-S.C., blasted both leaders for their childish actions. "One sophomoric response does not deserve another. Speaker Pelosi's threat to cancel the State of the Union is very irresponsible and blatantly political. President Trump denying Speaker Pelosi military travel to visit our troops in Afghanistan, our allies in Egypt and NATO is also inappropriate," Graham said in a statement. "I am glad the Speaker wants to meet our troops and hear from our commanders and allies. I am very disappointed she's playing politics with the State of the Union. I wish our political leadership could find the same desire to work for common goals as those who serve our nation in uniform and other capacities." NPR congressional correspondent Susan Davis contributed.